Traditionally made with tomato juice, vodka, a variety of spices, and garnished with celery, the Bloody Mary is the heartiest of cocktails. Michigan’s great pubs, taverns, and roadhouses offer up some of the most delicious Bloody Marys around. Prepared in a variety of unique ways, here are the 10 best places to get them in the state! MLive cited Fraser's Pub in Ann Arbor as having the second best Bloody Mary in the state. Since the number one title holder has since closed down, Fraser's takes the top spot by default. Made with a combination of vodka and beer—New Holland Poet Stout, specifically—and garnished with a range of ingredients including pickles, bacon, two different stuffed olives, and cheese, this drink combines several Michigan products to produce a can't-miss beverage. The Hunt Club makes it on the list for its almost gratuitous use of bacon. No, really. Bacon. Not only does this Bloody Mary come with a bacon-infused vodka made by a company called Ugly Dog, but a strip of candied bacon is used as part of the garnish. Essentially, the Hunt Club has worked to combine salty, sweet, and spicy into one mix that will leave you disbelieving that you're drinking something so heavy on the bacon. The Hunt Club is not alone in its use of bacon in a Bloody Mary—Kalamazoo is also in on the action, as exemplified by the Union Cabaret and Grille. At the Union, the Hail Mary—as it's known—offers bacon as part of the garnish, along with pickles in green bean and cucumber, regular cucumber, garlic and celery. But the Union ramps it up a notch by using a beef jerky vodka as part of a mix of six total vodkas that mix with off-the-shelf Zing Zang mix to produce a whole that actually keeps shifting as you drink it. Leave it to Ishpeming to produce a top-notch drink, and that's what you'll get at Brogie's Tavern. Each one is made individually, and features such oddities as Vlasic pickle brine and Frank's Red Hot sauce. Garnished simply with just a pickle, two olives, and a snit of Rolling Rock, it's a simple drink that still packs a lot of punch. Between the sour of the pickle, the heat of the hot sauce, and the simplicity of the garnish, it's a basic Bloody Mary experience that gets it just right. Now, if you want a Bloody Mary that's heavy on the homemade, swing by Motor City Gas Whiskey Distillery in Royal Oak. This one is made with Royal Oak Rye whiskey, as well as their own blend of spices and pickle juice to ensure a distinctive flavor. Throw in a healthy garnish of cheese, sausage, beef jerky, a McClure pickle and an olive and you've got a combination of tastes that's less a drink and more an adventure. If you've ever looked at your Bloody Mary and said “This needs more lobster,” then Muskegon's Dockers Fish House saw you coming. A combination of Absolut Peppar vodka and a homemade mix built around the ever-popular Zing Zang, this little wonder adds horseradish, various spices and several sauces to create a distinctive brand. The garnish features homemade pickles, olives, cheese, jalapenos stuffed with cream cheese and an entire lobster claw. Head out to Leland for what may be the strangest Bloody Mary you'll ever love. Dubbed the Chubby Mary, it's named that not because of its ingredients—tomato juice, horseradish, Worcestershire sauce and both lemon and lime juice—but rather its garnish. Inserted directly into the beverage is nothing less than a whole smoked chub. For those not familiar, it's a kind of fish, served whole. That includes head, tail and eyes. 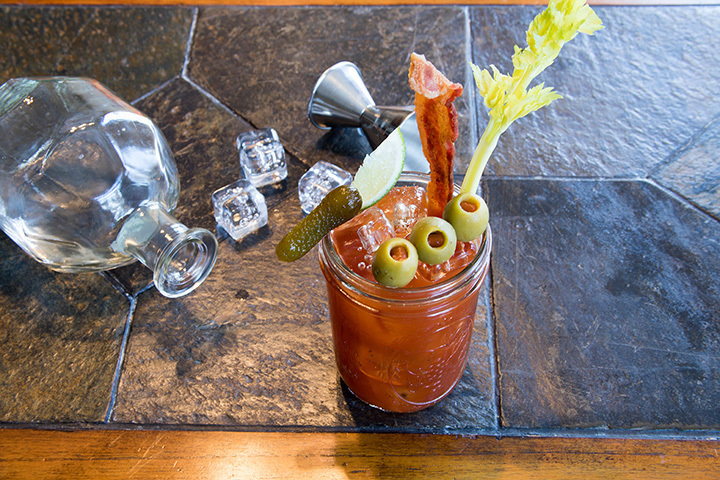 At Aubree’s, you'll find an impressive little Bloody Mary made entirely from a house recipe mix and True North vodka. Seasoned salt and balsamic vinaigrette top the rim, and the garnish is simple enough, offering celery, green olive, pickle and tomato. The real winner? Show up on Sundays and they're half-price, down to $4 apiece from the original $7.75 each. Come check out Suttons Bay, and while you're here, hit Boone's Prime Time Pub for a Bloody Mary that's almost more meal than beverage. Dubbed the “Massive Mary,” it's a drink that actually comes with a drink on the side: a five-ounce beer or cider chaser. But this 24-ounce monster packs an array of snacks for garnish: start with two sliders, one in beef and one in chicken. Now add onion rings, fried pickle chips, celery, lemon, lime, and olives to deliver a staggering value to its purchaser. If you're ready to go big, go to Clio for the Clio Roadhouse and its Bloody Mary Brunch. If you thought the Massive Mary was a little light on the snack action, you'll love it here. Start with a base of Zing Zang mix and the “Blazin' Sauce” commonly used on the Roadhouse's chicken wings, and the end result is impressive enough. The garnish, however, may blow your mind completely; they call it “brunch” for a reason. Check out the celery, cucumber, olives, pickles, and tomato, and then just lose it around the bacon, cheese, chicken wings, slider sandwiches, and the hollowed-out meat straw you're meant to drink it through.